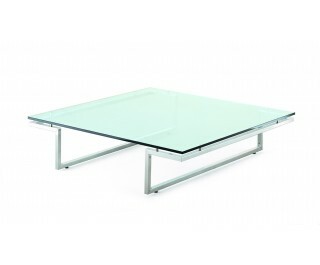 Tables with tempered crystal glass top (thickness mm. 15 for tables and mm. 12 for coffee tables) available in the following versions: extra-clear, float and white or black lacquered crystal. Square tubular frame, in polished aluminium (mm. 40x40 for dining tables and mm. 20x20 for coffee tables). Wings tables, available in many different dimensions, can be also custom made, always using our standard frames.